Bluestone pavers are used in a variety of architectural and design applications. These pavers are normally used in areas like courtyards, sidewalks, patios, garden paths, landscaping, pool coping, entertainment area, steps, and driveways. These pavers are made of natural stone, which is quarried around the world. Natural bluestone is usually cut into rectangular and square shapes and is quite thin. As a stone, bluestone is composed of quartz particles and sand compounds. In the United States, bluestone is quarried in the regions of Pennsylvania and New York. Aside from the mentioned applications, bluestone pavers can also be used as building stones, paving flagstone, and veneers. 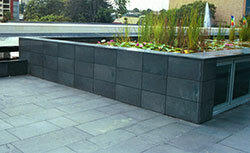 Many say that bluestone is one of the most versatile building stones and has been for centuries. Bluestone pavers are great for use as fireplace and sidewalk accents. These pavers are also used for the stairway construction and capping steps. The pavers are also very versatile when it comes to landscaping purposes. These pavers are also popular for use around the gardens and are a great addition to garden paths. No two bluestone pavers are alike and colors and hues vary from one paver to another. Colors can vary from grays, blues, green, brown, rust, purple, and even yellow. Such color variance is dependent on the depth at which the natural stone is quarried. Every time this particular paver is applied to a garden path, patio, or pool surround, an individual and unique look is created. Why use these pavers? Pavers crafted out of bluestone are highly versatile and durable. This is because of the natural stone’s dense and hard composition. These pavers can be used to surround any swimming pool as they are non-slip. Often called ‘slate,’ bluestone is one of the flattest natural stones, which make it easy to install. Bluestone pavers can be bought in various dimensions and thicknesses. This versatility makes the pavers suitable for various applications. These pavers also add beauty to residential or commercial properties and gives off an elegant and classy aesthetic appeal. Moreover, bluestone pavers come in various colors. Homeowners would not find difficulty in matching these pavers with the rest of their homes color themes. These stones would surely blend in any traditional or contemporary setting. These pavers are also very easy to maintain. However, one must make sure to seal these pavers so that it would be difficult for dirt, oil, or grime to penetrate them.